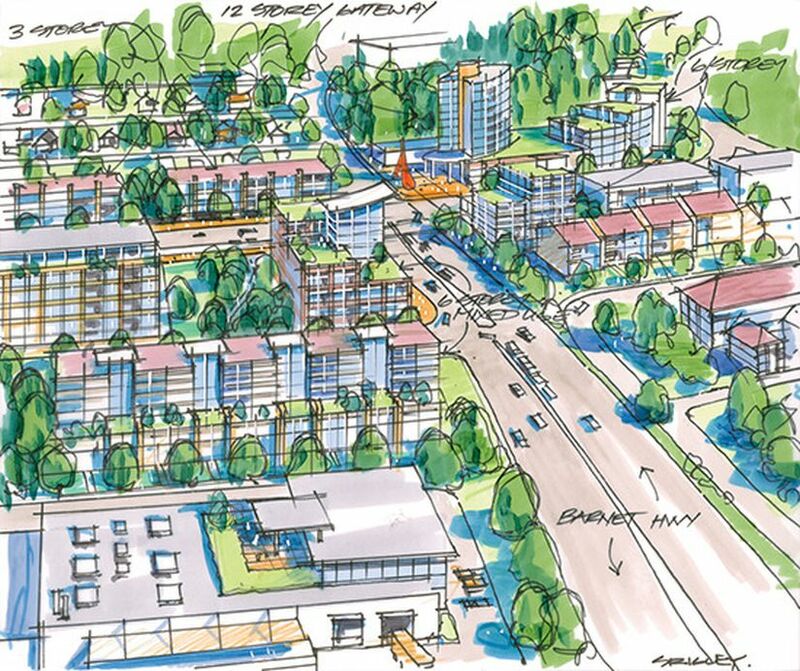 The City of Port Moody, a part of Metro Vancouver, has unveiled a draft Official Community Plan that would enable densification or superdensification along the new Evergreen rapid transit line, on track for completion in 2016. The updated Community Plan, commissioned by City Council in early 2012, shows that Port Moody’s population grew from 18,000 in 1991 to 34,000 in 2011. Part of that growth anticipated the arrival of rapid transit with the creation of a pair of trendyish tower-dominated neighbourhoods, NewPort Village and its clone. The TriCity News reports that the proposed planning changes could help push the local population to 60,000. The paper’s un-named reporter appears to support the plan. A provincial government depiction of the Evergreen Line emerging from under the Barnet Highway north of Clarke Road. It’s the same area that’s shown in the first drawing, minus the future property development that the City is imagining. 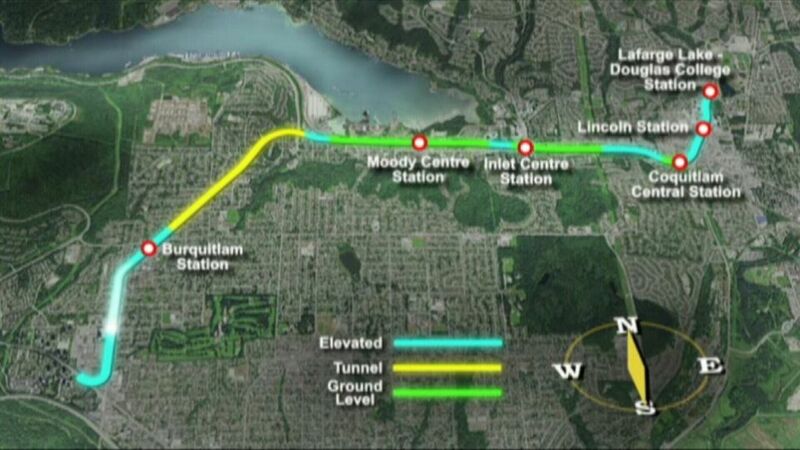 The draft Plan has emerged just as Evergreen Line construction has actually started. 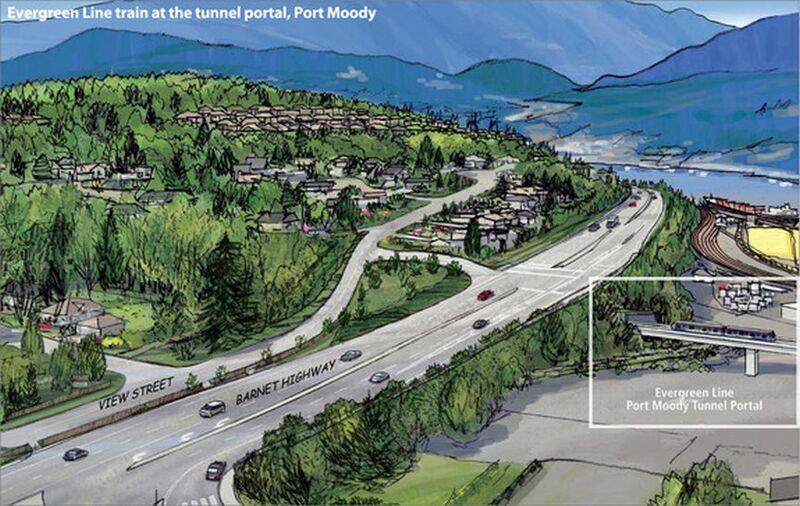 It was late 2000 when I attended a TransLink meeting in Port Moody to discuss the route for the project. On March 19, 2013, the City posted a notice on its website stating that tree and brush clearing was about to begin. On March 22, diverse politicians stood before the cameras to announce the names of the stations along the line. The project team faces numerous issues: there will be controversy around the relatively long distances between stations, the permanent traffic and access changes affecting established neighbourhoods, the displacement of older rental housing stock by new development, and widespread skepticism around the project budget and value for taxpayers. 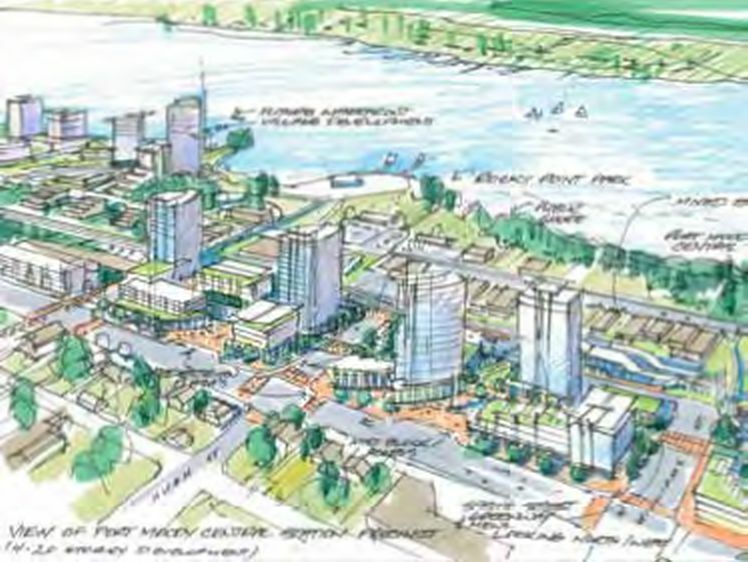 I should also mention that Port Moody’s draft OCP goes well beyond transit corridor issues to look at environmentally sensitive areas, cycling, housing and much else. The plan is scheduled for adoption in May 2013 after a period of public comment.